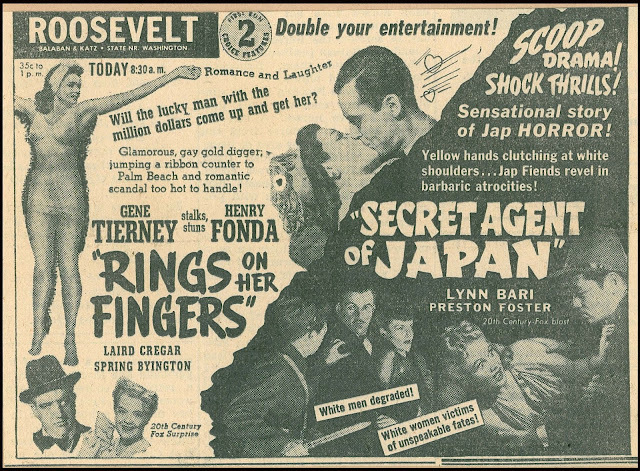 SECRET AGENT OF JAPAN (1942) --- Shanghai saloon owner Preston Foster sticks his neck out for nobody until marauding Japanese force his hand in lead-up to the Pearl Harbor raid. There's a secret code upon which nations are at stake, spy vs. spying with Brit operative Lynn Bari, plus occidentals eye-enhanced to look the Nippon part. Foster's a bit casual for a man in such dire straights. Why doesn't he catch a plane out of this hotbed? The usual Fox varnish on a "B" to make it look "A." Sen Young ably approximates the part he had in The Letter, and there are familiar, if sinister, faces occupying each dark corner. Another of those from early in the war where heroes play louse up to a last reel wherein commitment is assured and it's off to willing combat from there. Secret Agent Of Japan was rushed to theatres as Pearl embers remained hot. For $183K spent on the negative, Fox got back $593K worldwide, nice reward for a modest thriller that can still engage. Fox's On-Demand DVD is a stunner. 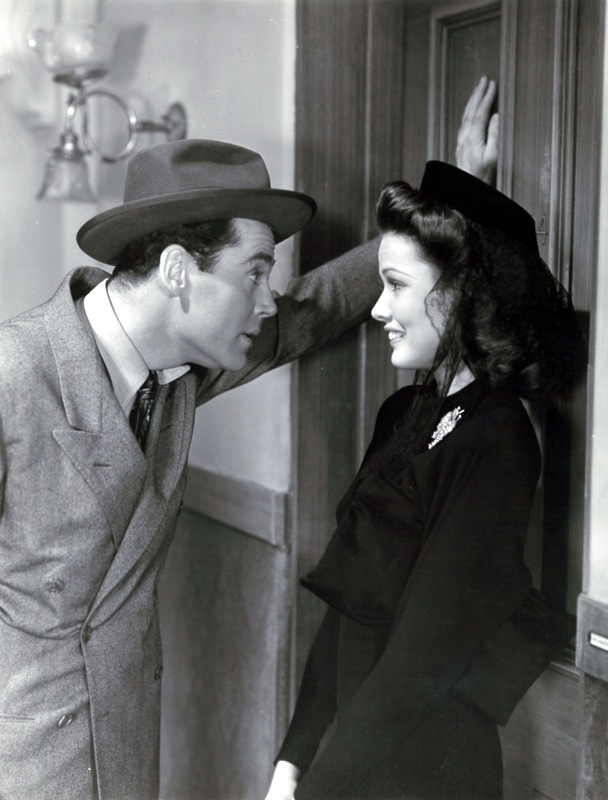 RINGS ON HER FINGERS (1942) --- Henry Fonda plays the fool for con-folk Laird Cregar and Spring Byington, their comely assist an at-peak Gene Tierney, being Fox sold on basis of looks and swimsuit art, that last heavily hypoed in ad art, as at top. 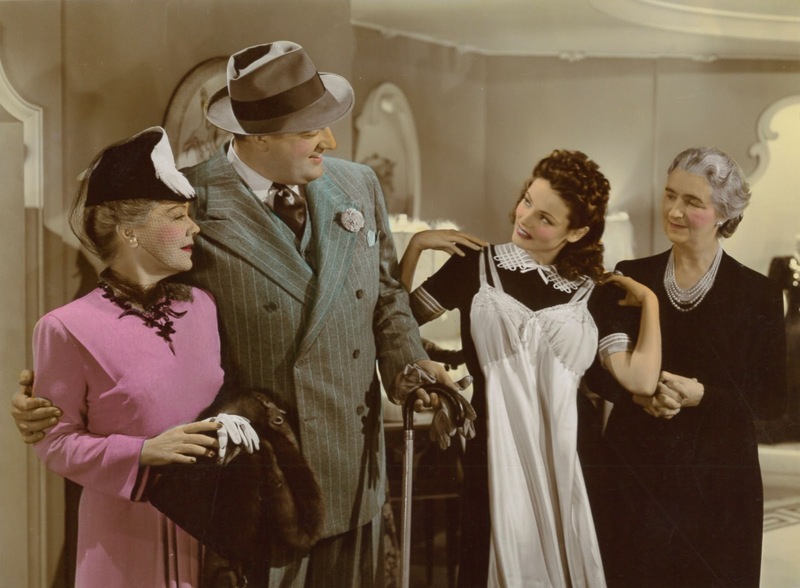 Gene is a reluctant swindler, being less wise to corrupt way of the world than a Barbara Stanwyck who worked unapologetic wiles on Fonda the previous year in an approximate same-story we remember much better, The Lady Eve. Did studios informally issue one another a license to steal? It was good for business to share; after all, they pooled movies in affiliated theatres to maximize profit, Fox houses for instance running Metro pics and both shoveling coin. 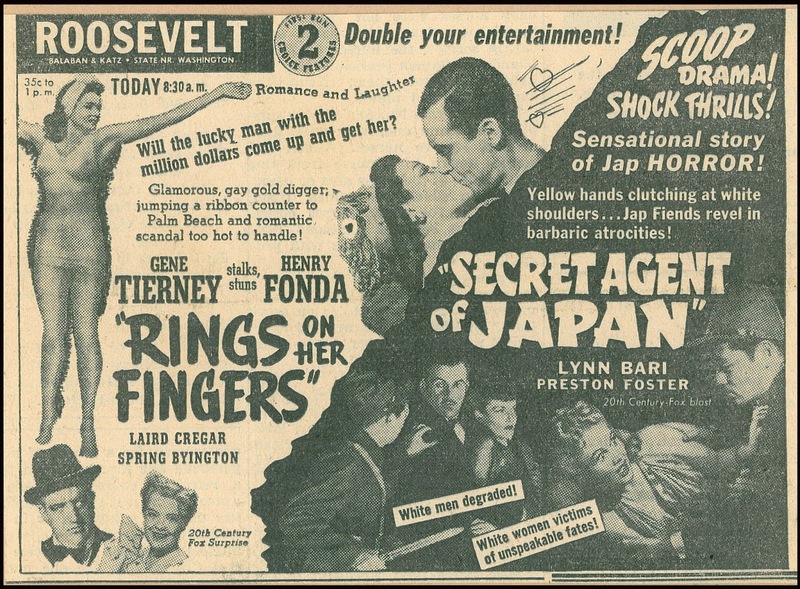 Hollywood's oligopoly was dollars for all participating, Rings' Chicago first-run with Secret Agent Of Japan being hosted by the Roosevelt Theatre, which was operated by the Balaban and Katz chain, whose parent company was Paramount. That's two majors feeding off one double feature, common currency during movies' Golden Age. Rings On Her Fingers is available from Fox On-Demand, the transfer a little darkish, but overall good.